The school will be defending their Carnival crown with a parade celebrating seventy years of Beija-Flor’s history. RIO DE JANEIRO, BRAZIL – In the early hours of Monday, March 4th, samba school G.R.E.S. Beija-Flor will compete in the Grupo Especial with their parade scheduled to begin at 1:35 AM. The group will present their ‘samba enredo’ (thematic samba composition) entitled, ‘Quem não viu vai ver…As fábulas do Beija-flor’ (Who did not see will see … The fables of Beija-flor) which will celebrate the seventy-year anniversary of the samba school through a presentation of allegories detailing its history and origins. The school’s ‘rainha de bateria’ (queen of the drum) will once again be Raíssa de Oliveira, who has represented Beija-Flor since 2003, photo courtesy of Gabriel Santos/Riotur. To celebrate their seventieth birthday, Beija-Flor, the reigning champions of the Grupo Especial, will use their Carnival parade to revisit their own history through a series of children’s fables that will commemorate the school’s key characters and significant past parades, while also critiquing contemporary problems in Brazilian society. The school will be hoping to defend their crown after their triumphant 2018 parade which saw them awarded Carnival champions. Beija-Flor wowed the public and judges alike with their take on Mary Shelley’s classic novel ‘Frankenstein,’ which also gave them a chance to explore Brazil’s ‘monstrous side,’ earning them a fourteenth title in the process. Beija-Flor’s 2018 parade won plaudits for its daring, including a ‘carro alegórico’ (allegoric car) that showed Petrobras‘ headquarters being surrounded by a giant rat; the school also invited drag artist Pablo Vittar and black singer Jojo Todynho to the parade as a message against gender and race discrimination, photo Fernando Grilli/Riotur. Beija-Flor is one of the most popular samba schools among cariocas, Brazilians, and foreigners alike, with fourteen championships under its belt, more than any other samba school aside from Portela and Mangueira. However, they can claim to have won the most championships in the more recent ‘sambadrome era’ of Carnival history. Originally founded as a Carnival ‘bloco’ (street party), in 1948, Beija-Flor officially became a samba school in 1953, representing the municipality of Nilópolis, located in Baixada Fluminense (a region of the state of Rio de Janeiro that surrounds the capital). 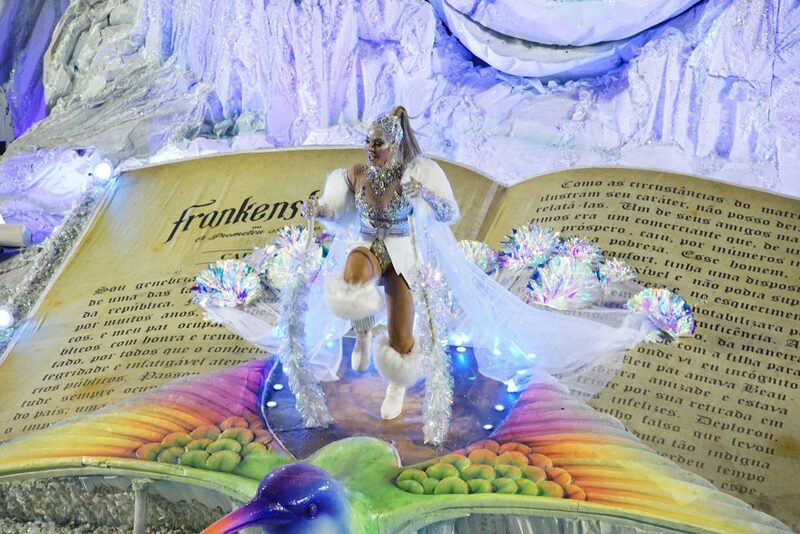 Represented by a white-and-blue flag, with a ‘beija-flor’ (hummingbird) in its center, Beija-Flor is also famous for its former Carnavalesco (Carnival designer) Joãozinho Trinta, who created some of the most spectacularly-designed parades in both the history of the school and of Carnival itself. This year will see the school without their other longstanding Carnavalesco, Laíla, who left the school after 23 years and 13 titles.